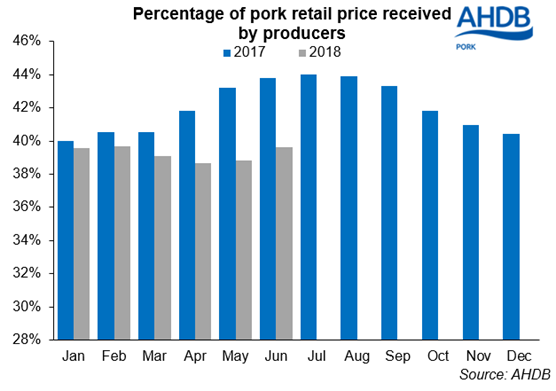 Compared to last year the share received by producers was four percentage points lower, reflecting the decline in pig prices, while at a retail level prices have increased. However, the producer share of retail prices last year was exceptionally high. 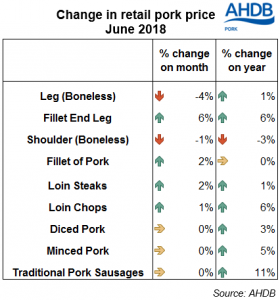 For specific cuts, the change in retail prices compared to the previous month was mixed during June, according to the AHDB retail price survey. The largest percentage increase was recorded by fillet end leg, up 6% month-on-month. Meanwhile, boneless leg joints decreased on average by 4% during the same period. Looking at prices compared to this time last year, most cuts have recorded a rise in price. Conversely, the average price of fillet of pork has remained steady on the year, while boneless shoulder joints were the only cut to record a price decrease.